Stephen Ewart and Stafford at the SYC in Phoenix, 2013. This isn’t about your child “making the team,” but about the team you build to support your child. One of my goals as a parent has been to give my son all of the opportunities I can, open as many doors as possible. It is up to him to actually go through them. My husband and I are, of course, the founding members of Team Stafford. I knew absolutely nothing about fencing when I was first looking for a fencing class. But I read Yelp reviews and went on the Swords website; it seemed like it would be a good fit. It was sort of nearby – everything is sort of nearby and sort of far away in Los Angeles, depends on how you look at it – our Southern California version of the glass half empty or half full. More important though, the coach had a good track record. He had students who had fenced internationally and had students fencing in Ivy League schools. So, I reasoned, if Stafford decided he did actually want to compete, something that was not really even a realistic possibility for my painfully shy son, he would not have to switch to a different coach or studio. It was sort of the same philosophy I used when I chose his school. I wanted a school that was k–12, so that we wouldn’t have that mad intense school search again in sixth or 9th grade. If he wanted to switch, fine, but we wouldn’t have to. And I found a school where students got into Ivy League schools, liberal arts schools, and top art schools. So, I figured they must be doing something right. Again, opening doors. Swords looked like a nice door to open. I have met a lot of coaches now, after seven years in the fencing world. Most are great. A few, for various reasons, would be a very poor match for my son. Tigran Shaginian, Swords head coach, and Sorah Shin, who was at that time with Swords Fencing Studio, were the third and fourth members of Team Stafford as I grew to think of it. (Stafford wasn’t actually even a member of the team yet. Or maybe a junior member. He had no vote at this point). As founding members of Team Stafford, our most important task was to create a strong support team. Again, at this time, it never occurred to me that Stafford would become a serious competitive fencer. So, my goal, with this team, was finding a place where he could grow to become more confident and assertive. I respect Tigran tremendously as a coach. He is great with Stafford (and Stafford is getting to be great with him). He treats him with a bit of tough love, a bit of frustration, a lot of humor, but always underneath it a support of Stafford as a boy and now young man. Stafford can frustrate him, especially when he says, “I know, I know,” and Tigran says, “You don’t know, or you would have done it…” but he will always come back to his point, demonstrate, and explain until he sees a glimmer of understanding. I try very hard to stay out of the conversations, especially after a tough loss on the strip at a NAC. Tigran knows what he is doing. Occasionally I will suggest to Tigran that Stafford might be more receptive after he’s had a bit of time to digest the loss. Mostly I try to keep out of it. I trust Tigran implicitly as a coach. I try to let him do his job. On Stafford’s 11th birthday, all he wanted to do was take a birthday cake to fencing class. He didn’t even want presents. He wanted me to make a carrot cake (I make a great carrot cake, recipe courtesy of my husband’s mother) and it was very important that we show up in between the advanced class and the beginning class because he mostly wanted the older boys to have a piece of his birthday cake. One boy, who fenced internationally and then continued on later to fence at Columbia, took a piece of cake, smiled at Stafford and said, “Thanks. Happy birthday, Staff!” Staff talked all the way home about how cool it was that this boy actually knew his name. An important element of Swords Studio is the emphasis placed on mentoring. Older boys help run the younger kids’ class, sometimes give lessons to beginners, and some return to help run the camps during the summer. My son has flourished under the attention of these older boys. He has looked up to them and they have offer encouragement and guidance that can only be given from those who have already traveled that path. I remind Staff now, as he moves up to being one of the older boys in the studio, and one that the younger kids look up to, that this is an important role he now needs to play in the studio. 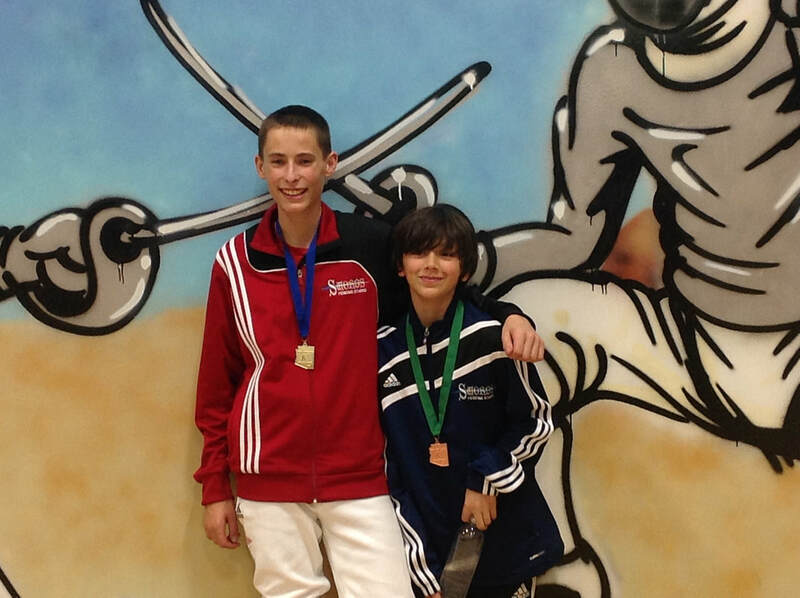 Stephen Ewart, one of our top fencers, who has made both the US Cadet and Junior team, has been an important mentor. He is now at Notre Dame, but he always finds us at NACs and checks in with Staff, offering advice and encouragement. Recently at a NAC, Staff was really struggling in his Division 1 pool. He was getting emotional, frustrated and upset, and his fencing was suffering for it. Stephen pulled up a chair strip-side next to Tigran, and sat through the next three bouts, encouraging him, joking with him, offering pointers. He got him out of his head, and, between him and Tigran, Stafford made it out of pools. At tournaments, Stafford has witnessed the camaraderie between the older fencers who have by now traveled to other countries together, fought each other on the strip too many times to count. And he wants to be a part of that. Now that Stafford is 15, and has been competing for a while, his circle of fencing friends has widened. And they come by and watch him fence and cheer him on and he does the same. These boys will be friends for a long time, they will travel, eat, play, fence, and go to college together. Whether they know it or not, in my book, they are on Team Stafford. Just as he is on theirs. Stafford’s teachers are also on Team Stafford. Before school even starts, I email them a tournament and basic travel schedule and also his training schedule, which is many hours almost every day of the week. I asked if it’s possible for Stafford to get assignments earlier in the day, or even the weekend before so that he will have time to get everything done and not fall behind during the week. Almost every teacher is happy to help. A couple of weeks before each tournament, I email out our actual travel days. We work together to make sure that Stafford knows what is expected of him while he is gone. I also include them in his struggles and his results. I often bring them back something from the international trips, chocolate from Austria for example. I really appreciate their efforts, and I know it takes extra work for them. We are fortunate that his school is so supportive. A lot of parents might not have thought about keeping teachers in the loop. Ask them to join the team. It can’t hurt. It can only help. Because Stafford has had some injuries (not all fencing related! ), we also have medical members on Team Stafford. (article on injuries coming soon!) I cannot say enough about the orthopedic doctors and staff at Children’s Hospital in Los Angeles. When he broke his wrist, Dr. Nightdale, former fencer who fenced at Princeton and also took part in the fencing Olympic Trials, was the one to catch the tiny break in his wrist, the scaphoid, one that is often overlooked, and if it had not been caught, would have prevented him from being able to successfully do a coupé. When Stafford got a spinal stress fracture, Dr. Skaggs, head orthopedist and spine and youth sports injury specialist, his head assistant Allison Lehman, and Jeremy Wong, physical therapist at Children’s, joined the team. They are now on the list of those we update as to Staff’s results in tournaments. They are rooting for him. We have now added a new physical therapist and trainer who works Stafford out twice a week and is quick to address any possible injuries or muscle issues. Our newest member of the team. Whether they know it or not, a lot of fellow fencing parents are also members of Team Stafford. I am referring to fellow Swords parents, and also the parents I have been able to meet at other tournaments. The parents at our club are wonderful. We all encourage our children to root for each other whenever someone is fencing, and know how much our children appreciate having friends cheering them on. We try to have team dinners at a NAC, and our fencers enjoy getting together and just having fun. We go to movies together and our kids sometimes meet at the hotel pool. We support all of the successes of Swords fencers. To be sure there are occasionally issues between kids, and even sometimes between parents, but for the most part, we all see the bigger picture and celebrate the victories and help console when there are the inevitable disappointments. The fencing community in general is an amazingly supportive community. I enjoy going to the tournaments, watching the boys I have seen fence for years now, as they improve and mature. There are many parents I have gotten to know and we all support each other’s children and efforts. We marvel with each other how they have shot up over the past few months, how their voices are changing. We compare notes on everything from helping our students handle school demands to recommendations for local restaurants. In my mind, they are all ancillary members of Team Stafford. Okay, at a certain point, Stafford gets a say in things. He needs that, and I need that. At a point, part of supporting your fencer is giving him more independence. And a say in some of the things that matter. This goes back to my piece on setting goals. Your fencer, as he gets older, will have a stronger opinion on what he wants to do. Does she want to compete? Try to make team? Fence in college? Does he want to compete internationally? I think that at a certain point, you have to give your child the freedom to make those choices. Listen to her. Also, listen to yourself. And ask yourself periodically – Are you doing this for your fencer? Or for yourself? If your fencer’s physical therapist recommends exercises to help an injury heal, make sure your fencer does it. That is part of your role supporting the team. And, yes, I hound Stafford to do his homework when we travel. He is just not one of those who is going to willingly sit at his computer in the hotel room in Milwaukee or Kansas City. It’s not going to happen. So, you have to know your child, and support those team members who have done their part to help, by making sure your fencer is doing what is expected of him. As important as it is to create a support team, it is also important to be able to revise it. Sometimes, you think someone is supportive, and it turns out that they are not as supportive as you had thought. We all have our own agendas and goals. Be willing to acknowledge, preferably without any drama or hard feelings towards that person, that sometimes a person is not as supportive as you had thought. It happens. None of us do anything alone. I believe success or failure is not based solely on the individual, but on the people around him who support him. The people who encourage her and stand by her. It is up to you, as a parent, to put that support team together, be a part of it. And enjoy the ride. Losing is Not a Dirty Word. Help your child understand how to lose, and you will help your child win. I find it interesting that so often the first question out of an adult’s mouth after a tournament is, “Did you win?” We are so focused on winning. I have seen parents really upset when their child loses a bout. I will admit, I have certainly been there. I have had to take a quick walk around the block at a NAC, after watching Stafford blow an 8 point lead and lose. All that money. Flights, hotels, travel expenses. For what? I’ve been so upset. But, I have a great poker face. I’ve developed it out of necessity, because that is what my son needs. He needs to see me shrug my shoulders and say, “Oh, well. No big deal.” It sometimes takes me a minute. Or two. He needs that from me because he is so overwhelmed with disappointment, frustration, and anger at himself. And I see him after he loses. He beats himself up. Nothing I say will ever be as harsh as what he is saying to himself. How do I know that? He told me. When he told me that, I realized I needed to change, to find a way to help him deal with losing. And I started to think about losing. What it means. In the beginning, Stafford lost all of the time. It wasn’t a question of if, but when. And when he lost, we would talk about why he lost. There were lessons to be learned. We talked about goals more than we talked about winning. I refer to some of them in other blogs. One of them was to stop walking off the end of the strip. 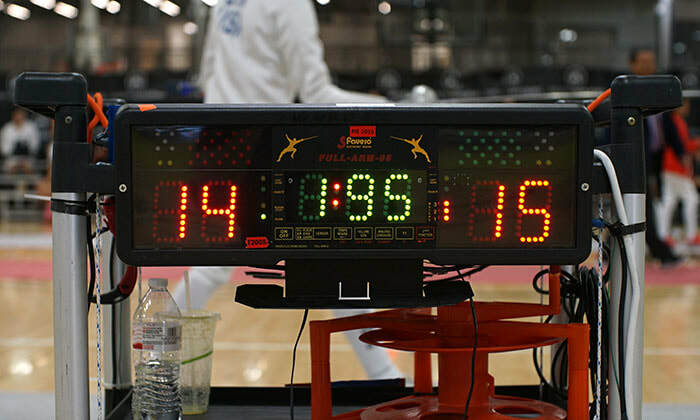 The result of accomplishing that goal, was, of course, learning how to defend on the strip, and not giving away points, and of course, that affected the score, and eventually, the fencing got better and the score got better. But the focus was not on winning. Winning is a funny thing. When my son wins, it is, “Yay! I won!” But when he loses, it is, “Why did I lose? What did I do wrong? What do I need to fix? Improve? Change?” Sometimes the issue is mental, or emotional. Sometimes it is technical. Sometimes, it can be all three. When Stafford won Y12 at Summer Nationals in 2016, I was elated. So proud. And after we finished celebrating, one of the first things I said to him was, just remember, you are going to lose again. Eventually. The first tournament after Summer Nationals, he lost. That lesson was an easy one, though it involved emotions and his mental strength, not technical things like point control. Don’t walk around acting like you are unbeatable, because you are not. And you have a target on your back now. You have to keep focused. In 2017-18, Stafford really struggled. He had qualified for his first World Cup, but barely, and he really needed to do well in the October NAC in order to have enough points to qualify for the next one. So, what happened? All of that pressure was overwhelming. He fell apart on the strip. I shrugged. I knew how much he wanted it. I knew that we would have to figure out how to deal with the pressure. But how? We talked about it. Then, the same thing happened in November. After a brisk walk around the convention center in Kansas City, I put on my poker face and went in to help my son figure out how to deal with the pressure. This was a much more complicated lesson. And a much more important thing to learn how to deal with than how to stop walking off the end of the strip. It took months. And we tackled it in many different ways, from many different angles. At the March NAC, in the Y14 team event, Stafford’s team took Gold, and he was the team anchor. He also placed fifth in Y14. All of our hard work (mostly his) in tackling how to deal with the pressure started to pay off. This summer in Saint Louis, at Summer Nationals, Stafford took home three medals in four events. There is no way he could have achieved those results without having lost so completely in October and still doing poorly in November. I know this sounds crazy, but appreciate all of those losses, and make them mean something. As your child progresses in fencing, fencing itself gets more sophisticated, and the pressure gets intense. In Y10, a child just has to show up at a regional event to qualify for Summer Nationals, and they are guaranteed to get out of pools and experience at least one Direct Elimination bout through Y14. But everything changes in Cadet. The bottom 20% out of pools get eliminated and don’t even make it to the DEs. Everything gets much more competitive, and much more stressful. Helping your child through those early losses, helping him find a way to make his fencing stronger, or helping her control her emotions on the strip, will pay off so much more in the long run than some medal. Stafford has a lot of medals. He might remember when he got each of them. But I bet he remembers the losses more. And the lessons learned. There is another element to losing that I think is important, which I touch on briefly in the beginning here. I believe it is important to model appropriate behavior as an adult when your child loses. I try to show Stafford how to lose by being an example. I try my best to never show any anger or frustration. I don’t yell at him, or berate him. It’s not easy, sometimes. And I never mention the expenses or in any way hold him responsible for that. “I paid all this money and for what? you lost! All those lessons, flights, etc.” After all, it was my choice to pay for those lessons, and I made the reservations, I bought the tickets. And, I knew, because I am an adult, that my child might lose. So when your child loses, as she eventually will, don’t punish her for your choices. Instead, take a moment, or take a walk, and then go back to your child, who is probably much more upset than you are, and see if you can help. Be supportive, encouraging, positive. As an adult, when I lose, I don’t want the people I care about to yell at me. Or lecture me. I expect some support. Losing will also help your child learn about sportsmanship. In fencing, fencers have to shake their opponent’s hand and salute the referee when the bout ends. I have seen fencers throw their masks, refuse to shake hands, and basically throw temper tantrums. That behavior can result in a black card, and elimination from the tournament. When a child loses, I have seen parents yell at the referee, at the coach, at their child. It is like a parent temper tantrum. And I expect to see that same behavior from the child eventually. Because that is what they are being taught. I believe we have a huge responsibility to help our children become successful participants in society and in the world. We all want our children to succeed. But true success encompasses failure. So work on your poker face. I do. I had no idea when my son started fencing, that in a few years we would be traveling all over the country and even internationally, going to new cities, and having some great adventures together. There is a lot of stress and pressure involved in these trips, especially as fencing becomes a more and more important part of life. It is helpful, I think, to remember that there is more to this life than bouts and training and results, and I try to mix in some fun and unique experiences while traveling. When we went to a tiny town in Austria for the World Cup in October, after all of the fencing was over, we traveled to Vienna and spent a day exploring the city before flying home. 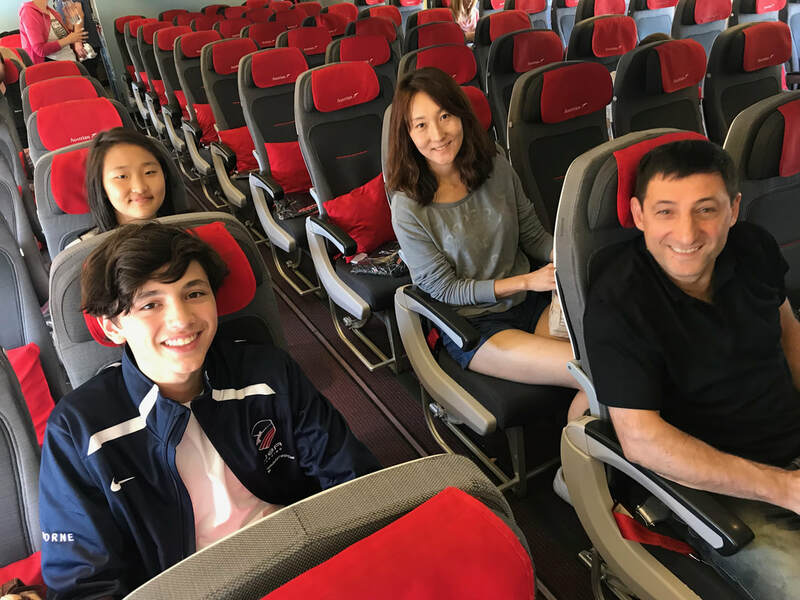 Luckily, we get along well and enjoy traveling together, and through trial and error, together we have come up with a healthy routine to minimize the stress of traveling for competitive fencing. Stafford is an active part of this process. I try to involve him and expect him to remember ways that he can avoid stress, so it is not all on my shoulders. Please bear in mind, this blog is only my experience. While writing this, I have been talking to several other families about their experiences. This blog offers solutions that I have found in dealing with time change, unexpected travel delays, packing, but most importantly, trying to make the experience not only low stress, but also fun. In the end, of course, you will have to figure out what works best for your family and fencer. In 2017-18, Stafford and I went to Kansas City, Anaheim, Memphis, Baltimore, Virginia Beach, and Vienna, Austria, with Saint Louis still to come. We also hit regional tournaments in San Diego and Escondido. And we anticipate the same amount of travel next year, barring injuries, etc. We have learned a lot on the road, and with each trip, we learn more. One of my biggest goals, as a mother and fellow traveler, is to avoid stress, support my son’s goals and make the experience of traveling and competing a positive one. Your child is going to be under a lot of stress before a tournament. You are also going to be under a fair amount of stress. At least I am, and for me the stress is spread out among several issues, including packing (and not forgetting anything), logistics of getting from here to there, reservations, weather concerns, and finances. 2017-18 was especially stressful due to snowstorms, a closed airport in Norfolk, thunderstorms in Dallas, and other issues. Anticipation is an important element of avoiding stress. Keeping in mind what "might" happen, can certainly help if and when it actually does happen. And it is important to realize that some things you can control and some things you can’t. When things happen that are just out of your control, it helps to be able to roll with the situation and show your child that everything will be fine. Easier said than done. Planning how to get where you are going can set the tone for the entire experience. Because of work and school issues, we typically leave the day before the event. Some people have the luxury of leaving two days before the event. I have not yet seen the need to do that. Note – this does not include international events, when you leave several days before the event. · Tripit Pro, TripCase, Triplist, helpful apps for travel, packing, etc. Tripit Pro and Tripcase keep track of your reservations, including flights, hotels, trains, etc. You can get notifications on delays, etc. Very helpful. In Triplist, you can create packing lists or import lists from excel, etc., and use them repeatedly. Tripcase and Triplist link together. I have created a fencing equipment list and a packing list that I shared with my son. As he packs his stuff he checks it off the list. It gives him a sense of independence and responsibility. It also keeps me calm. Don’t think however that means I don’t review everything on the way to the airport. And yes, we almost always have to pull over and check in the bag to make sure. Book Your Hotel Early. USA Fencing releases the North American Cup schedule usually some time in May. In fact, the schedule for 2018-19 is already available online. Once they announce the schedule, they also include hotels at a discount rate. You will be charged, at this point in time though it could change, $4.50 at the time of booking for your room. Make your reservations for the duration of the event because the day schedule will not be available until closer to the tournament time. Last year USA Fencing announced the location for Summer Nationals in 2018 in April of 2017. I reserved a room, a double, at the Hilton, from June 27th through July 7th. I now know I need the room from the 27th through the 4th. It is much easier to change a reservation that to scramble for a room closer to the time. Figure for Summer Nationals there are several thousand fencers coming into town. Better safe than sorry. Some Hotel Suggestions – The closer the hotel, the better. I recommend choosing hotels that connect to the venue during winter months on the East coast, for obvious reasons. Nothing is worse than watching fencers struggle through snow or an icy wind with those big bags. I also recommend choosing hotels close to the venue for the rest of the NACs. Some fencing families intentionally stay far away from the convention centers so as not to be overwhelmed by all of the fencers visible all the time during these events. And sometimes, you can find cheaper rooms further away. However, for me personally, I know that Stafford is not going to be jumping out of bed at 5:30am to get to the venue by 7:00am. Especially if there is a time change. My goal is to make sure he gets a good night’s sleep, get him up, get him fed, and get him to the venue not only by close of check in, but with enough time to check and make sure his weapons are working, warm up, get in a few practice bouts. Often, the first day starts with equipment check, which can also take a lot of time. 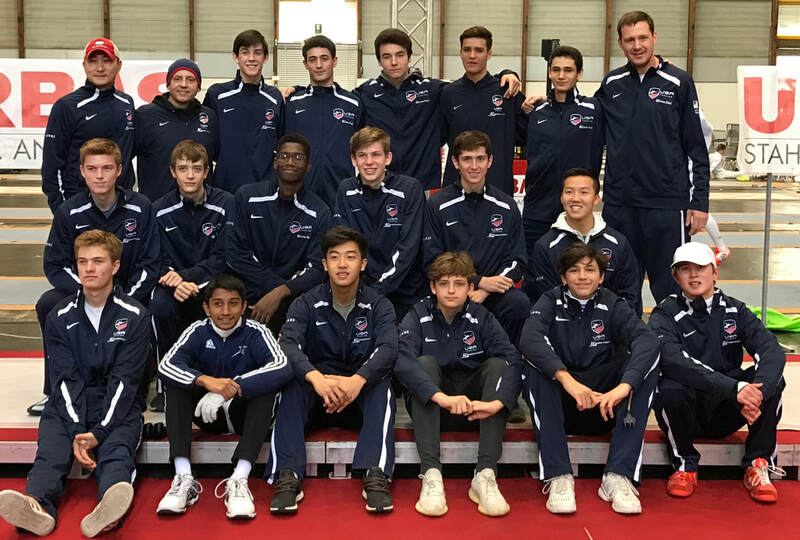 · A word about equipment check – if you are not able to get everything checked the day before the actual fencing event, and the event starts early in the morning, be prepared to wait in line with your fencer’s equipment. I want Stafford to be focused on warming up. A light jog around the venue, jumping rope, etc. In these instances, I am happy to stand in line so he can prepare. And sometimes, that line can be long. Also, these trips have proven a great opportunity to give Stafford a bit of freedom. When he was 11 or 12, I would let him go to the convention center by himself after we had gone together once. He loved the feeling of independence, and, if our hotel adjoined the convention center, or was across the street, I didn’t have to worry as much that he might get lost or forget to look both ways before crossing those streets. Sign up for rewards programs at hotels. · Try to Book a Direct Flight to the Event. Nothing is worse than flying in to some new city for a tournament, and having to worry about making a connection. And, lets face it, even if you have tons of time between flights, there are always those unexpected problems. Your first flight gets delayed so you miss your connection, or, after racing to the next gate, you find your connecting flight is stuck in Atlanta due to a tropical storm. You’ve already invested a lot in this event, not just the entry fees, but also the training and the time and emotion that goes into training. Why risk missing the actual event? Fly direct. · Try to Book an Early Flight. If you are on an early flight and something happens to your flight, you are far more likely to be able to catch the next flight. If you are leaving later in the day, there might not be a later flight. Most of the NACs are in the Midwest or on the East Coast. Being from California, we have the serious disadvantage of dealing with a time change. If we are going to the East Coast, we have a three hour difference. The March NAC always lands on the weekend that the time springs forward. I have a great photo of my son on his way to check in at 7:00am, which was 4:00am our time. Getting up early to catch a flight helps kids (and parents) fall asleep early that night. I take any help I can get. Another reason for an early flight is so your child can get to weapons check the day before the event. · Get to the Airport Early. This is a great way to start the trip and avoid unneeded stress. When I am running late, I get impatient. I snap at my son and usually we race out the door without something. And then, we both arrive at the airport frustrated and annoyed with each other. Give yourself plenty of time to get to the airport, check in, and get through security. · Carry on the Mask, Glove, Fencing Shoes, and Jacket. Do not check them. Another important reason to book a direct flight is you have a better chance of getting all of your bags, including that fencing bag. Nothing is worse than the face of a fencer as he watches all of the other fencers claim their fencing bags at the end of the flight, and realizes his bag is not actually going to appear. I have seen fencers have to buy all new equipment the morning of the event. New glove, new mask, new jacket. So much for the glove that finally got worn in so it fits the hand perfectly. Weapons are easy to replace, and once your child is competing at the national level you will become familiar with the armorer and become accustomed to purchasing new weapons as well as repairing those blades that worked perfectly that morning. But masks, gloves, and shoes are important personal items, much harder to replace. And masks are expensive. One of our fencers lost her bag on a flight and it was delivered to the hotel at 3:00am. So that fencer and mom had a stressful night worrying about getting up early enough to replace the equipment, and then, the mother had to go down at 3:00am to claim it when it arrived, so neither got much sleep. I am happy to report that the fencer did very well the next day, despite the added stress. And she carries her mask, glove, shoes, and jacket with her now. · Checking That Fencing Bag. I strongly recommend investing in a good fencing bag for traveling. We use a Leon Paul bag. A lot of fencers use a hard plastic case that is for golf bags. If an airline asks what the bag is when you are checking in, say it is sports equipment (which it is). If you say weapons or swords, you might get an uninformed baggage checker who is going to get concerned. If you are checking in your bag online ahead of time, just say it is a regular bag. If there are any issues with it, you can always deal with it at the airport. At worst, there might be an extra fee. I have never heard of a bag being refused, so don’t over worry about this. I almost never have any issues with traveling with a fencing bag. Southwest just checks them right through, and they don’t charge any baggage fee for the first bag. Some airlines will actually try to charge extra saying it is a bulky item. International Tip: A fencing mom whose daughter traveled to several World Cups gave me some great advice. If you are going to a World Cup and are traveling with another fencer, divide up the swords between fencing bags. This improves the odds that you both will have at least two swords. Hopefully both bags make it, but just in case…. · Bring Food for the Flight. This might seem obvious, but bring food for your child. I pack my carry on with food for my son, cliff bars, chips, fruit, Hawaiian rolls, pretzels, etc. You can’t take liquids through security, and so, for some reason, a lot of people think you can’t take food. You can. And you can bring it from home and avoid waiting in long lines for overpriced food at the airport once you get past security. · Booking Your Return Flight. I try to book a flight leaving the day after my son fences. And, I make a reservation for the afternoon, not early in the morning. It is a luxury, which doesn’t actually cost anything more. Other than time. You never know how long these events will last, and having to worry about making a flight the night of an event when you would like to just focus on supporting your fencer is a drag. And your fencer can sense that tension. It is a challenge no matter what, but you certainly don’t need to add the stress of seeing the time frame slowly close on catching your late afternoon or evening flight. You can spot those parents a mile away, bent over ipads or squinting at phone screens, trying to figure out what flights are available the next morning, calling the hotels to add another night’s stay. Traveling on Southwest has definite advantages, as you can cancel a flight up to 20 minutes before, and get a full refund and apply that full fare to travel the next day. No penalties. Thank you, Southwest! Another advantage to leaving in the afternoon the next day is you get to wake up without stress and just enjoy a little break from fencing and school, a little mini-vacation. And you have time to yourselves. So often during these NACs, all day is spent at the venue. My son and I have so many great memories of cities that we would not have even seen if we didn’t stay that extra half-day. In Milwaukie, for example, after a long weekend of fencing, because we chose to fly out in the afternoon the day after fencing, we were able to sleep in, go say hi to our friends who were fencing on Monday, and then take a great walk along the river and explore the city. That was the only time we had on that trip that wasn’t either in the hotel or in the convention center. In Kansas City, when it was raining, we had a fierce couple of ping pong games on the top floor of our hotel before we checked out. We didn’t even know our hotel had a ping pong table before that last morning. This isn’t just about fencing. Or at least, in my opinion, it shouldn’t be. · Have Some Fun! Research the cities. In the past two years we have been to Dallas, Seattle, Cleveland, Baltimore, Milwaukie, Kansas City, Salt Lake City, Memphis, Virginia Beach, and Saint Louis. We are getting a chance to see cities that we might never have visited otherwise. It is nice to take some time to really experience these places. Find a local restaurant. Try the local flavors. Memphis and Kansas City have great barbeque. Milwaukie has a great river walk. Also, if we have a free day between events, we will try to get a group of the kids together and go to a movie. It is great to find a way to forget about the fencing and all of the stress for a while. I hate that phrase "making memories" because it seems to take spontaneity out of the equation. Enjoy. Even if everything goes wrong, it can be great. And, my philosophy is nothing ever really goes wrong. It just changes. This is all a great adventure. So, are you ready? Five years ago, my son competed in his first tournament. After eight months of fencing classes and constantly saying he was not interested in competing, my son unexpectedly announced at the end of a class that he thought he might like to try entering a tournament after all. It turned out there was a regional tournament the very next weekend. I had no idea what a regional tournament was. His coach said we should sign up on the US Fencing website, go to the tournament, and however he did, as long as he competed, he would qualify for Summer Nationals. Summer Nationals? I had no idea what that meant. But the coach seemed to think it was a good thing for him to do, so okay. I signed him up for a competitive membership at US Fencing, and we went to the tournament that weekend. It was a disaster on so many levels. Though we did find a great parking spot, right in front. I found out later finding parking was almost as competitive as the fencing itself. Who knew? The tournament at LAIFC (Los Angeles International Fencing Center) was an RYC (Regional Youth Circuit). There were a number of different events going on, so though there were only 14 fencers in my son’s Y10 (Youth ages 10 and under) event, the place was crowded with fencers, parents, coaches. It was overwhelming. And we had no idea what to do, where to go, etc. Luckily, a very nice mother at the desk, Ellen, who I still see all the time at tournaments, introduced herself and gave a quick rundown of what we needed to know. How the tournament worked, pools, DE’s (Direct Eliminations), and that we needed two body cords for example. The basics. Two weeks later, much to my surprise, he wanted to try again. Luckily there was another tournament coming up that weekend. This time is was just a little local tournament. Much less intimidating. That afternoon, again, I drove back with a boy wearing a fencing mask crying in the back seat. But this time, about half way home, I heard this tearful little voice say, “So, when is the next tournament?” And we were in. He came in last in the next tournament as well. But he took his mask off on the way home. We were making progress. Summer Nationals took place in Anaheim that year. We went because we didn’t have to travel on a plane, so it would not be too expensive. Why not go? It would be a good experience. We drove down the day before his Y10 event. As we pulled in to the hotel, it was a sea of fencing bags. Every single person, young and old, was pulling a fencing bag behind them. My son sat in the back seat, looking out the window in horror. “I can’t do this.” I knew exactly how he was feeling. It was an intimidating sight. “Tell you what,” I said. “I’ve already paid for the room. Let’s just check in. The convention center is attached to the hotel. We can just walk over and find your coach, and look around and see what it is like. And if you don’t want to fence, that’s fine. You don’t have to. No pressure.” He ended up placing 41 out of 60. More important, though, he fenced. He was 9. And he has never looked back. That was in 2012. What is amazing to me, and what I certainly didn’t know at the time, was that a lot of those fencers are still competing. These boys have grown up together. They see each other at tournaments across the country. They follow each other on snap chat and Instagram. They text each other. My son has friends from across the country, from New York and Texas. He will go to his first international competition, a World Cup in Austria in four weeks. He, we, have come a long way. We have learned a lot. I am starting this blog to help other parents, new to fencing, understand how wonderful this sport is, how it works, and how to support their child through success and failure. I will cover basics, from the first competition to how to cope with injuries. I would love feedback, welcome follow up questions, topic suggestions, and any stock tips you care to share!